The Bostonians in Distress, attributed to Philip Dawe, Robert Sayer and J. Bennett, 1774, Library of Congress. 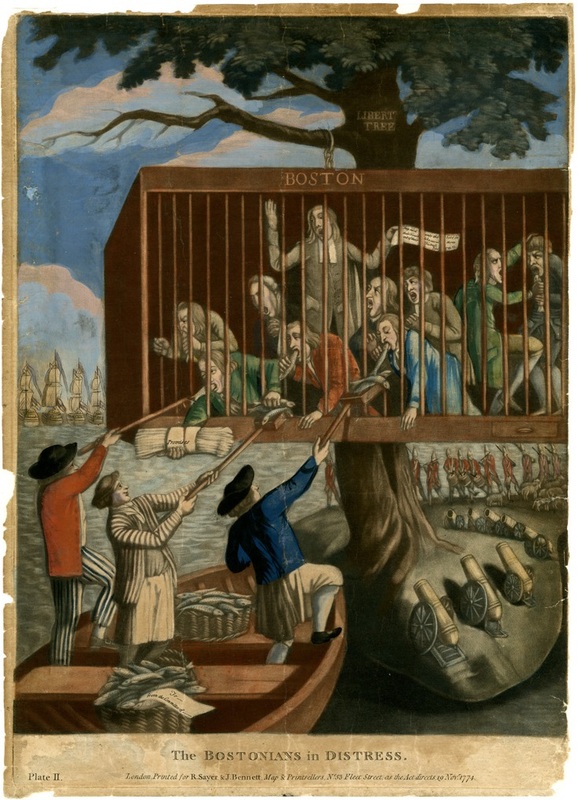 The Bostonians in Distress, attributed to Philip Dawe, published by Sayer and Bennett, 1774, New York Historical Society. Quick note: the New York Historical Society version was attributed to a dead link, and may be misattributed. Please let me know if you have any information on this colorized piece. In this political cartoon Dawe addresses the closing of Boston harbor and the effort by Boston's fellow American colonists to supply the town with the food and goods needed to survive. The other colonists are represented by three sailors standing in a jolly boat, shoveling piles of fish to the caged Bostonians. Dawe's piece is a companion to his more famous Bostonians Paying the Excise-Man, or Tarring and Feathering. Here he has converted the mob into a caged and starving rabble that fight each other to eat the raw fish provided for them. Significantly, the noose in the first print has been converted into a chain by which the cage now hangs from the Liberty Tree. The sailor on the far left wears a round hat with a band around the crown (which gets colored out) and without trim, turned up a bit on the front and back. His red jacket is single breasted, and he wears a white shirt without waistcoat. 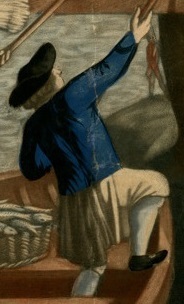 The blue striped trousers end above the ankle, showing his white stockings and rectangular buckles. In the middle stands a sailor in a wider brimmed round hat with a shorter crown. His neckcloth is a solid color, and again he wears no waistcoat. 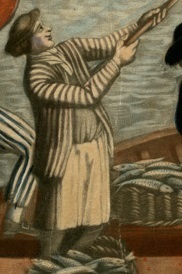 Notably, this tar's white neckcloth is tucked into his shirt, which is darker than the white shirt most sailors are portrayed wearing. His jacket is a bit odd: there are no buttons at all, and the fabric is vertically striped. Beneath his petticoat trousers you can see the legs of his breeches. 'HMS' and 'USS': Not a Thing?